Declaring climate change to be an indisputable threat, Gov. Arnold Schwarzenegger unveiled a plan to combat global warming by setting goals for reducing California's emissions of greenhouse gases. "Today, California will be a leader in the fight against global warming," Schwarzenegger told a United Nations conference on the environment on Wednesday. "I say the debate is over. We know the science, we see the threat and we know the time for action is now," he said. Schwarzenegger's plan calls for reducing the state's emissions of greenhouse gases to 2000 levels by 2010, 1990 levels by 2020, and 80 percent below 1990 levels by 2050. Under the governor's executive order, the secretary of California's Environmental Protection Agency will be charged with overseeing efforts to meet those goals, and will report on the state's progress in January and every six months after that. "The targets are an excellent starting point, and now the heavy lifting of enacting policies to meet them must begin," said Jason Mark, California director of the Union of Concerned Scientists. Schwarzenegger did not announce specific new policies, but said he would move ahead with greenhouse gas emissions standards for automobiles starting in 2009. The Bush administration has joined automakers in challenging those standards in court. Many scientists believe that greenhouse gases — which include carbon dioxide, methane and nitrous oxide — are trapping heat in the Earth's atmosphere, altering weather patterns, shrinking wildlife habitats and raising sea levels. Schwarzenegger unveiled his plan at the opening of the five-day United Nations World Environment Day Conference, the first ever held on U.S. soil. No major Bush administration official has announced plans to attend. 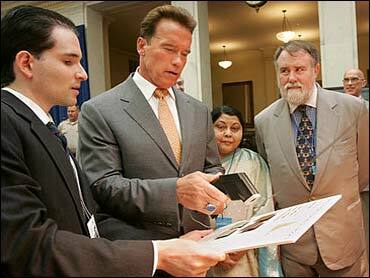 Schwarzenegger has made other efforts to reduce greenhouse gases. A "hydrogen highways" program encourages the installation of enough hydrogen fueling stations to enable the use of zero-polluting vehicles across the state, and his "million solar roofs" program would subsidize the installation of solar power equipment in homes. Some critics have questioned Schwarzenegger's environmental credentials because of his ownership of gas-guzzling Hummers, the civilian version of the military Humvee. "Time will tell whether the governor's 'Global Action Plan' is really 'action, action, action,' or nothing more than 'talk, talk, talk,"' said State Treasurer Phil Angelides, who has announced he is running for governor next year.